BBC NEWS | Americas | Did Mexico over-react on swine flu? 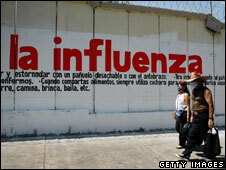 Did Mexico over-react on swine flu? As tests suggest the swine flu virus in Mexico may be less virulent than first feared, the BBC's Stephen Gibbs in Mexico City looks at whether the response was an over-reaction. Pedro Aparicio shows me his receipt from the supermarket. "My wife thinks I spent too much," he says. Just before the partial shutdown of this country, the primary school teacher stocked up on everything he thinks he, his wife, and their young daughter Naomi will need for the next five days. "Milk, beans, tuna fish, everything," he says, as he shows me his fully-stocked fridge. "We are under quarantine." I remind him that the country's partial shutdown of the economy does not include supermarkets. "But we don't want to go out, it might be risky," he says. A little over a week ago, this global health crisis was triggered when the Mexican government announced that it had detected a new strain of flu virus, and was closing all schools. It informed the World Health Organization (WHO) that it suspected 60 people had already been killed by what soon became known as swine flu. So many deaths, after apparently a very short time, worried the Mexican authorities. "We were spooked," one government official admitted to me. "People seemed to be dying, and we didn't know why." But when those first figures were released, the word "suspected" was crucial. 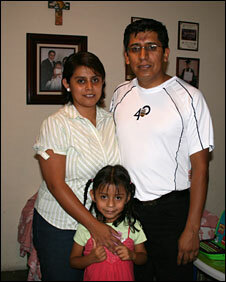 Mexico was not certain at that stage that 60 people had been killed by swine flu. And it still does not know. It takes several days for tests to be properly verified. The current, confirmed, death toll stands at 16. Initial data indicates that apparent mortality rate is comparable to that of seasonal flu. In the grandiose health ministry building in central Mexico City, I sat down with the country's Health Minister, Jose Angel Cordova. As a nod to the enduring risk of infection, he prefers not to shake hands these days, instead offering the sleeve of his perfectly cut suit. I asked him whether he thought that his government had initially over-estimated the deadliness of the virus. "Maybe, yes," he said. But he stressed that his experts were dealing with so many unknowns at that stage. What they did know was that the virus was potentially virulent and potentially deadly. Humans had no natural resistance to it. As they tried to work out who was dying of what and why, it is worth remembering some complicating facts, which are peculiar to Mexico. Most of the suspected fatalities were, and still are, in the capital, Mexico City. The city is at an elevation of 2,300m (7,540ft). It is home to almost 23 million people. Most days, a thick polluted smog can be seen hanging over the vast metropolis. Every year, swine flu or not, over half a million cases of respiratory problems are reported in the city. "You can imagine that right now there is a lot of paranoia," says Dr Franciso Moreno, an expert in infectious diseases at the ABC medical centre in Mexico City. "About 90% of the patients who have come to the hospital in the last few days have mild respiratory problems, from other causes." The deluge of suspected cases has made it extremely difficult to tell who has swine flu, and who does not. H1N1 has had consequences which few would have ever predicted. Something which possibly began in rural communities in Mexico has led to the quarantine of a luxury hotel in Hong Kong, and the slaughter of all the pigs in Egypt. And has this all been a global false alarm? The Mexican health minister says it is still too early to say. He says that the threat of new viruses should not be under-estimated. As he spends the bank holiday weekend watching TV with his family, Pedro Aparicio says he thinks that the government did exactly the right thing. "You can't be too careful," he says.